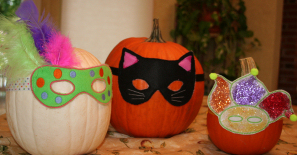 Keeping It Simple – Halloween Masks for My Pumpkins. I can't decide if we should add a face or not - I kind of like them as they are. What would you do? To download the mask designs click here. I am happy to share them with you but remember that I am not a professional digitizer and these designs were quickly made just for the pumpkins. Embroider the placement run (color 1). Use whatever color thread you like for this. Place the rectangle of felt so it completely covers the run. You can free float it or use a small amount of adhesive spray if you are more comfortable. Embroider the tack-down run (color 2) using the same color as in color 1 as long as it is not black. Remove the hoop. Trim closely around the outside of the cat head and inside of the cat eyes using your snips of sharp scissors. Do not cut the stabilizer. Put the hoop back. Using black thread embroidery around the head and eyes (color 3). Remove the hoop. Clip around the pink stitching of the ears. Remove the design from the hoop and tear away the stabilizer. Place the mask on your pumpkin. If you want to get more creative use colored markers to draw a face. The Dot Mask is made basically the same way. The Jester Mask needs to be sewn out on felt as you just cut outside the candlewick stitching and add sparkle as desired (Emma loves to put glitter on things so of course we had to do at least one this way). You could use the cat mask for a person as well. Dress in a black sweat suit. Add a stuffed tail (or a black boa section would work well) and some gloves and voila you are a black cat. These pumpkins could also make great center pieces for a party. Add whatever embellishments you like to make them eye catching. If you make any masked pumpkins be sure to post them or email them to me so we can see all see what you did. I love this idea. I don't have kids at home any more, but still love to have a little something for the children in my complex (I live in a condo). These are really terrific and show off your embroidery work to strangers as well. Great! Your KIS series is so informative and innovative. You are really a gem! Thank you! What a neat idea! Turned out really well. Made masks for the grandchildren. On the cat, I stitched the ears and whiskers first. Added a back piece inside the die line which reduced the rough stitching on the inside. Then stitched the outline stitching catching front and back pieces at once. Made them from black felt and the ear colors were different shades of pink and tan so each child could tell theirs from the others.